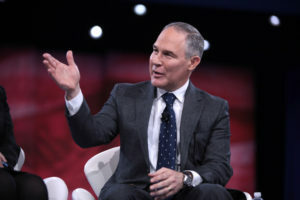 Oklahoma Attorney General Scott Pruitt yesterday faced a confirmation hearing before the Senate Environment and Public Works Committee for administrator of the Environmental Protection Agency. Pruitt was introduced by both Oklahoma U.S. Senators Jim Inhofe and James Lankford, who praised the nominee for his work in Oklahoma to protect the environment and fight federal overreach. With a slew of questions on climate change, the Waters of the U.S. rule, the Renewable Fuel Standard and more, the hearing lasted nearly seven hours. Below are four key highlights of yesterday’s hearing that shone a light on a potential Pruitt-led EPA. It’s possible to protect the environment and grow the economy. As reiterated throughout the hearing, Pruitt said the narrative that pro-energy means anti-environment must change. He also emphasized the importance of analyzing the economic impact of environmental regulations. The U.S. has made “great progress” over the past few decades in protecting air and water, while still growing the economy, he said. Americans don’t trust the EPA. Several committee members, mainly from strong agriculture states, said landowners, farmers, ranchers and small businessmen do not trust the EPA. For eight years, those regulated by the EPA have felt as though the agency does not listen to their concerns. Pruitt said he is committed to being “open and transparent” in his role as EPA administrator. In building “collaborative cooperation” between states and the EPA during the rule-making process, Pruitt said he will work to restore confidence in the agency. States should have more power. Pruitt said he believes the U.S. will have better air, better water quality and a better environment when the EPA works as a partner with states, not as an adversary. Individual states have better expertise on how to regulate the environment than the federal government. However, Pruitt said “recalcitrant” states should be reprimanded when not enforcing federal regulations. The EPA will follow laws set by Congress. The job of the EPA administrator is to follow laws created by Congress, Pruitt said. He repeatedly emphasized his obligation to following the guidelines of Congress, and maintained his commitment to upholding the rule of law. Although a committee vote has not yet been scheduled, Pruitt is expected to be recommended for confirmation. He must then be confirmed on the Senate floor. Learn why farmers and ranchers support Pruitt here.